Michael: Let's get started, our first lick is based on a common blues bass type run. Michael: This is a common chromatic bass run. Now we can add the open B string to enhance the sound. Michael: Notice how you can play the open B string each time you play the chromatic notes. fenderbluers: Hey teach did jimmy page do a lot of shredding or just blues licks. Michael: He uses all kinds of techniques fender, we'll cover some in this lesson. Now we can use a descending bass line while you play the open B string. robbie: What key is this in? Michael: Good point Robbie, this is all in the Key of E. Notice the chords at the end of this lick, it's the E7 #9 or otherwise known as the Jimi Hendrix chord used in "Purple Haze" and "Foxey Lady." robbie: Can you transpose this lick to the key of A?? Michael: Sure you can transpose it, let me give you a jam track to play over. 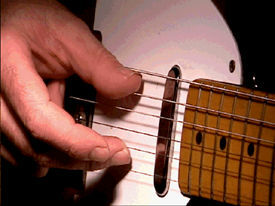 esph100: Are you finger picking this song, or switching between pick and finger. Michael: So we basically follow the I, IV, V blues progression E, A, B, so all the licks are based on each of these chords. Now you can add a guitar lick at the end of the progression in the E Minor Pentatonic scale pattern on the 12th fret, the chords for the lending of the progression is A, Bb, B and you add a few licks in-between each chord. fenderbluers: Didn't he just slide up after he played it. Michael: Yes he did, the last chord is the A7 #9 played on the 12th fret. esph100: how far did you slide up though? fenderbluers: Hey teach what kind of amp and/or effects do you use to get that page sound. Michael: I'm using a Tele through a Korg Pandora Box. OK, here's the entire progression with all the parts we covered so far and a jam track to practice over. Michael: The E7 #9 is a good chord to know. 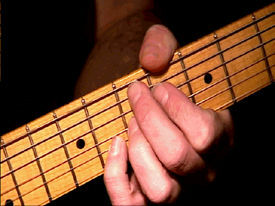 You'd be surprised how many bands use that chord; Hendrix, SRV, Chili Peppers, Pearl Jam, etc. etc. etc. esph100: What guitar do you prefer teacher? Michael: Depends on the sound I want to get. Various guitars have different personalities, on these licks I'm using a Fender Tele, Page used a Fender Broadcaster for most of his early recordings. Michael: Here comes a jam track for the last tab, you can even play lick in the E minor pentatonic scale I sent earlier. OK let's try another lick, this is a common blues lick. Michael: Here's a jam track for that lick. Michael: Well time to go, hope to see you all next lesson, good bye!! !